The reality of being a busy Mum is REAL but it doesn’t have to be an excuse. On the Busy Mum Programs we use short effective HIIT training workouts that fit around a family life. The below 6 Minute Leg Blast is a great fat burning workout which uses the biggest muscles in the body to speed that metabolism up and create those slim toned legs. Read our 6 Best Exercises for your legs article to dive into why. The exercises we use can be changed around to suit your own fitness levels, also repeated 2, 3, 4 times to suit the your daily regime. I always say the mornings are the best for Mums to exercise, when they have more energy and it sets you up for the day ahead with those natural endorphins pumping for an amazing day ahead. 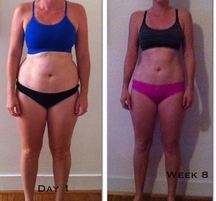 Reaching your weight loss goal with short workouts is totally doable with all of our programs, we highly recommend our 8 Week Busy Mum Program to get best results possible around a Busy Mum life. Place feet shoulders width apart. Put your weight on the soles of your feet and tighten your core. Move to a seated position as you exhale and rise up on an inhale back to standing, squeezing your glute muscles as you rise. Start by Lying on the floor with your knees bent so that your feet are flat on the floor. Keep your back straight. Place your hands by your sides palms flat for stability. Raise your glutes off the floor by extending your hips upward while pushing down through you heels. Continue until your back, hips and thighs are in a straight line. Hold for a count of one, then return to the starting position. Step back and lower into lunge until back knee is just above ground. Push through front heel to drive up and forward into start position. Drive opposite knee up at end of movement. Repeat for specified reps and perform set on opposite leg. Nearly the same as a traditional squat but start with your legs a little bit wider than shoulder width apart. Put your weight on the soles of your feet and engage your core. Lower down to a seated position as you exhale and rise up on an inhale back to standing, squeezing your glute muscles as you rise. For the Narrow Squat: You’re going to bring your feet together, and we’re just going to squat straight down from here. You’re going to shoot your hips all the way back, keeping the weight in the heels. You’re going to push those hips all the way back. Squat down, and then just press it straight up. You’re going to take it down and up. Start standing up and place feet shoulder width apart. Bend knees, palms touch, lower hips to a seated position as you lean slightly forward. Put your weight in the soles of your feet. Engage core. Hold this position for the duration of the exercise. Same as a tradition squat but add a small jump when you return to your standing position. Place feet shoulders width apart. Put your weight on the soles of your feet and tighten your core. Move to a seated position as you exhale and rise up on an inhale back to standing and take a small jump, squeezing your glute muscles as you rise.